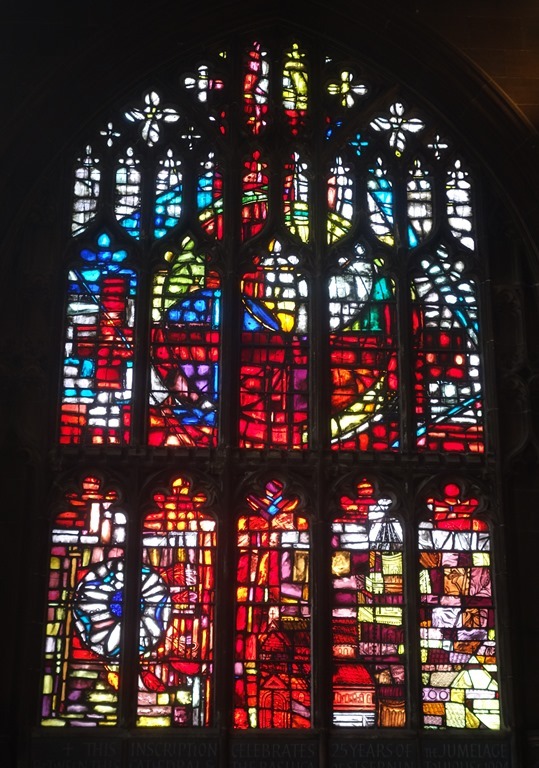 It was designed by the artist to commemorate the cathedral’s rebuilding after the blitz and represents the flames of the fires caused by the bombing. It’s a simple design but very effective, especially on a sunny day with the sunlight illuminating it – you could easily convince yourself that the street outside was ablaze. 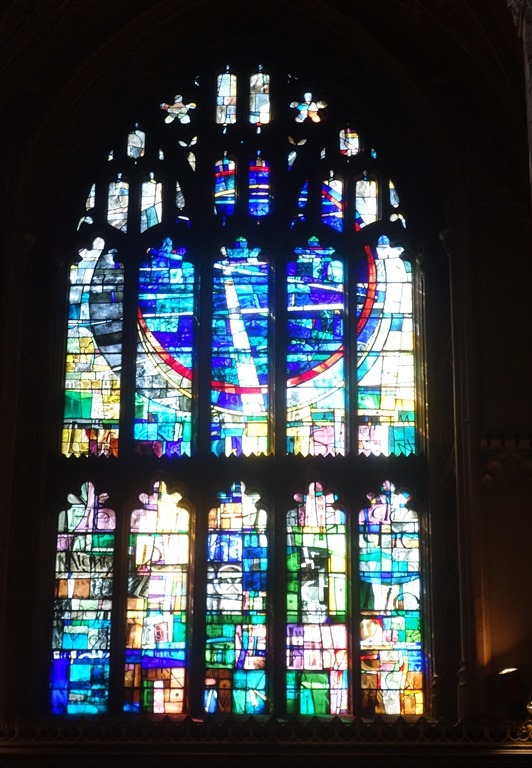 The window was destroyed by the IRA bomb that was exploded a few streets away in 1996, and it had to be reconstructed by the artist. 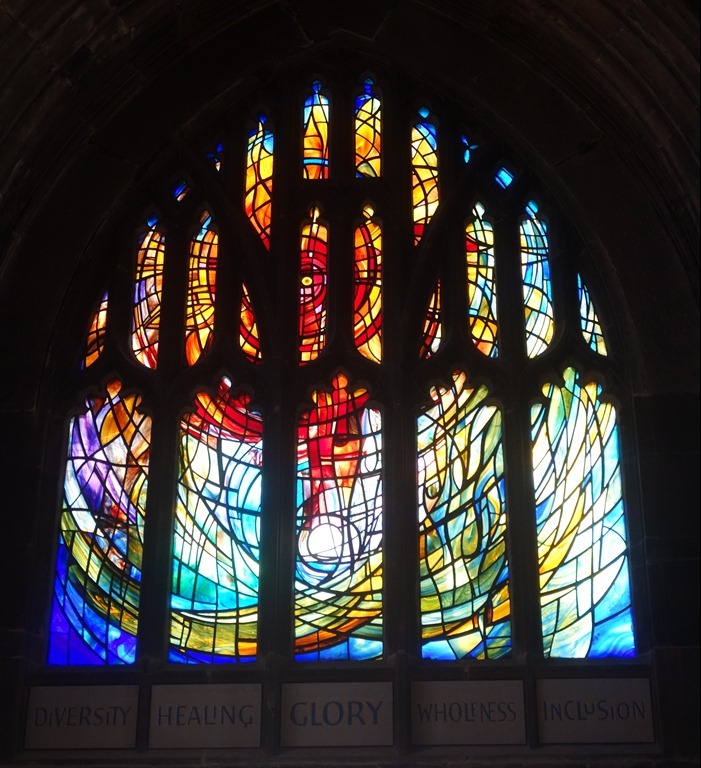 This is the Healing Window, (2004) by Linda Walton, which was installed to commemorate the restoration of the cathedral following the bombing. This is the most recent window – The Hope Window by Aaln Davis – that was installed in October last year and dedicated in December. 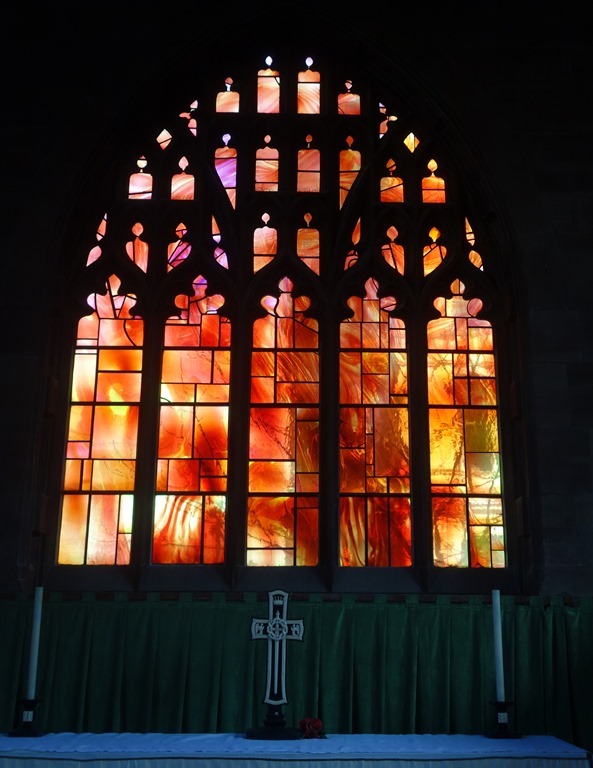 The abstract design of the new window revolves around the themes of hope, innovation, growth and new life. The statue in front of the window is of Humphrey Chetham, founder of Chetham’s school and library. 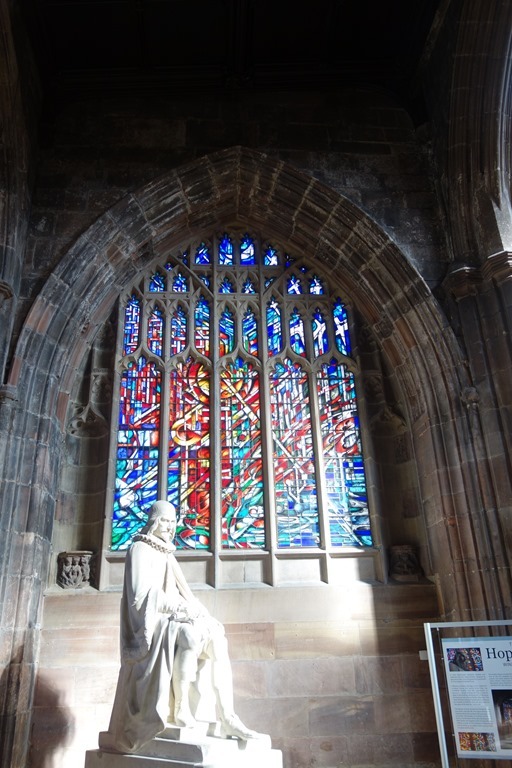 This entry was posted in Architecture, Art and tagged Art, Manchester, Manchester Cathedral, Stained glass by ms6282. Bookmark the permalink. For all my life I’ve lived within 20 miles or so of Manchester (a little further when I was at University in Liverpool) and I’ve been visiting since I was 16 when I started going to gigs at the Free Trade Hall. Yet last year was the first time I went into the Cathedral! 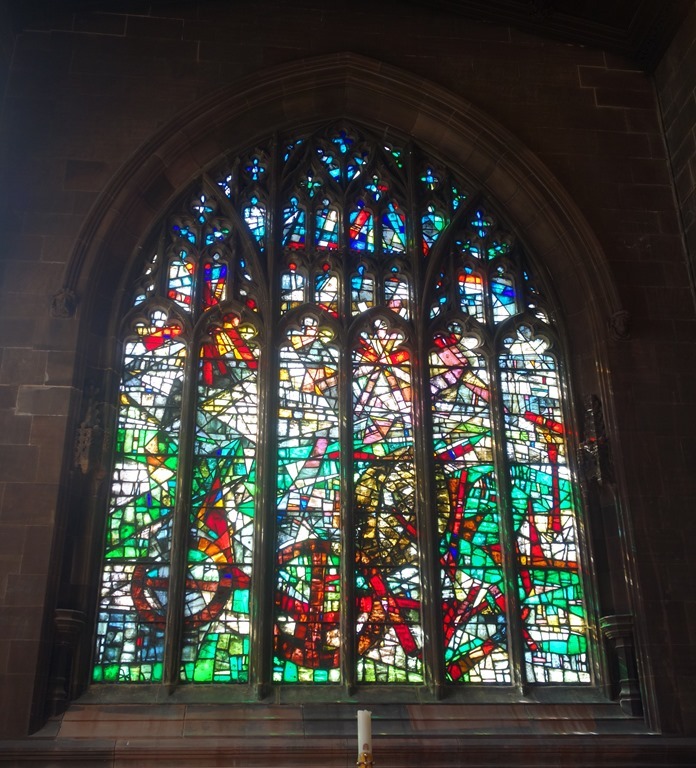 Great post – been to Manchester Cathedral many a time but never really had a good look at all the windows. You have inspired me – next time!! Thanks Joy. Best to go on a sunny day when the windows are shown to their best. Stunning! I love stained glass. They are. I love the contemporary style too. Yes, I almost added that – I think I prefer the modern, more abstract windows, to the biblical scenes of old (though they are beautiful too). 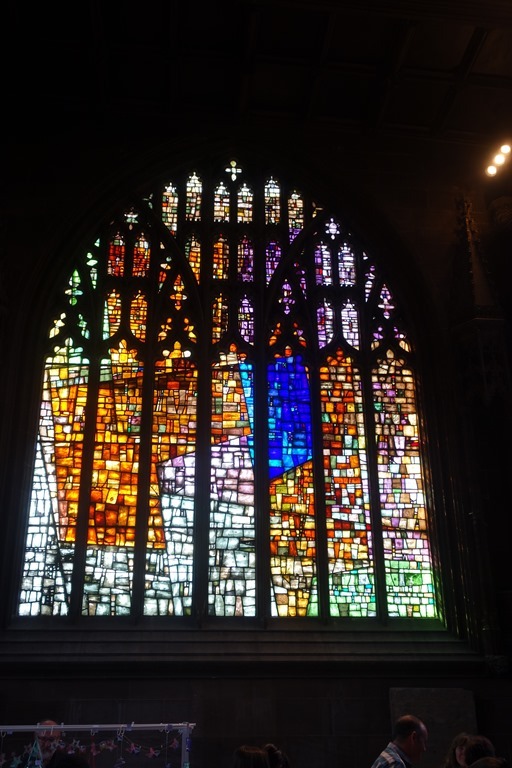 I love stained glass, but in the seven years I lived in Manchester I never visited the Cathedral! Sometimes you fail to appreciate what you have on your doorstep! My loss, but at least I’ve seen some of the windows now. Stunning! Thanks! It took me 59 years to get round to seeing them!